This completely revised and updated edition to Bird s classic textbook deciphers all the new scientific advances that have cropped up in the last several years, and conveys them in his typically clear and plainspoken style that renders even the densest subject matter freshman-friendly. 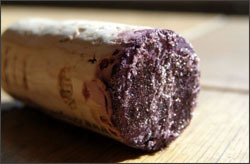 Many wine drinkers think there is a problem when they see tartrate crystals in the bottom of their wine glass. But there is absolutely nothing to worry about, apart from visually. The potassium tartrate crystals or 'wine diamonds', as they are sometimes called, are formed naturally during the course of the winemaking process and are small, clear or white. There are many naturally occurring grape acids, the main one being tartaric, others include malic, lactic, acetic and citric acid. If grapes are harvested early with a fairly high acidity content then there will be a greater possibility of tartrates settling out later on. It occurs predominantly with white wines grown in cooler climates or higher altitudes that would be less ripe than those grown in warmer locations. As grapes ripen, their natural sugar content rises while at the same time their acids fall, so it is very important to pick them at the optimum of both the sugar content and acid level. Sometimes this is not as easy to do due to poor weather which slows down ripening, keeping the acid levels high. It is usually from these grapes, when made into wine, that tartrate crystals are likely to form. After fermentation finishes and the wines have been racked, there is little or no natural sugar in the wine. It is at this stage that the wine tastes its worst, that is very astringent with acids to the fore and no balancing sweetness. What is needed now is to try to reduce the acid level without additives, so by chilling the wine down, usually by cold stabilization, the tartrate crystals will form and settle out sinking to the bottom of the vessel. The wine is then racked again before the wine warms up. Although most of the tartrate crystals will be removed, some will not have been. They will have dissolved back into the wine, and therefore be ready to settle out in your glass after you have had your bottle in the fridge, or cool cellar, prior to opening it. Why are 'Wine Diamonds' or tartrate crystals a sign of quality? Acids are very much a winemakers friend, as long as they are not excessive, as a high acid wine is going to keep very much better, and longer, than one with a lower acid level which will tend to be lacklustre and flabby. With more and more great white wines being produced at high altitude, it is these acids that are giving them a seal of quality. Of course the wine has to have good natural sugars to create that vital sugar/acid balance that all winemakers strive to achieve with their wines. But without enough tartaric acid the wine would have no structure or backbone at all. The crystals themselves are totally harmless, it is just a matter of aesthetics, so next time you come across what looks like sugar granules in the bottom of your wine glass, don't worry, just think 'quality'. Rob Hemphill has been a professional winemaker for over 20 years, and is now a freelance marketing writer living in the UK. He specializes in wine consultancy and has a wide knowledge in vines, vineyards and wine growing techniques as well. His favorite varietals are Gewurztraminer and Shiraz. To learn more about wine, please visit Understanding Wine where you will find a wealth of interesting wine information. Ever made Homemade wine before? Don't know how to, why not visit http://winemakinghome.blogspot.com. Just wanted to leave a note for author Rob Hemphill, regarding his article on finding tartaric crystals in wine. Funny thing is, I stumbled upon it quite by accident! I was trying to understand why I was finding a lot of crystals in the grape juice I'd pressed from Muscat grapes to make grape jelly! After spending 3 hrs on the extruding process, I had to refrigerate the juice for 5 days before I had time to make the jelly! The juice had been pretty cloudy from the beginning, so I had been worried about it. But once it was boiled with pectin, it began to become more clear, and then adding the large quantity of sugar to make the jelly, it became extremely clear. But I digress...back to the crystals...It was upon scraping the bottom of the large pot that held a couple gallons of the fresh juice, that I noticed something on the bottom. At first I thought perhaps I'd missed a lot of the grape seeds when i ran it through the cheesecloth to strain, but then realized they weren't seeds at all! I couldn't understand where they came from. So here it is, past midnight, and I came up to "google" search for the answer. And your article came up. I read the whole thing, and found it very informative. I'm going to show my kids in the morning, and tell them you refer to them as wine diamonds! Anyways, I just wanted to say thank you for your informative article, and to let you know that it helped me to understand about the tartaric crystals I found in my grape juice! So I showed them this morning (that letter was written last night) and my son in high school is going to to bring the crystals in to his chemistry class to show the naturally formed crystals, and explain to them how and why they occurred. just wanted to say thanks for the informative article, even though it was directed more for those making wine, than those making jelly!